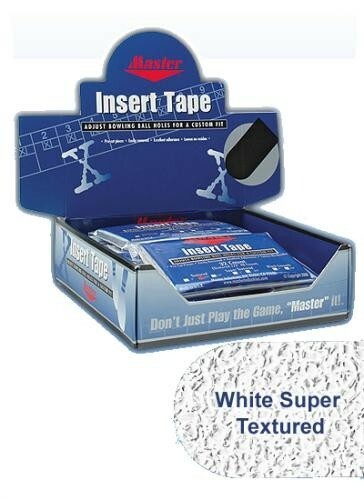 Master Insert Tape 1" White Super Textured-12 Pk. Master Insert Tape 1" Black Smooth 12-Pk. Insert tape designed for use in thumb and finger holes. Comes in a reusable poly bag that contains 32 individual pre-cut 1" x 2" pieces. Due to the time it takes to produce the Master Insert Tape 1" White Super Textured-12 Pk. ball it will ship in immediately. We cannot ship this ball outside the United States.